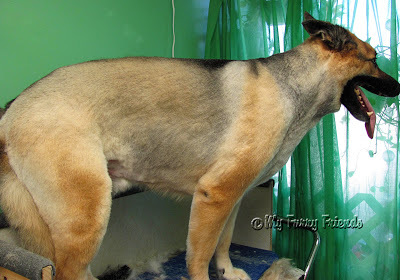 Home → GSD FAQs → Should I Shave my German Shepherd? Most people asking if they can shave their German Shepherd are worried about their dog being too hot or unhappy with the extreme amount of hair the dogs leave around their house. So, let’s talk about how to fix these two legitimate concerns. Is my German Shepherd too hot? German Shepherd Dogs have two coats of hair. They have a thick undercoat, and they also have an outer coat. The undercoat help keeps them cool (read more about humidity below). It’s basically like insulation, like you have in the attic and walls of your house. Indeed, their coat can become too “hairy”, but properly grooming your shepherd will keep them happy and cool. Properly maintained, your dog’s coat protects them from the sun and keeps them cool. If their hair and undercoat is impacted, in doesn’t vent properly and also traps the sun’s heat, making your dog extremely hot. Proper grooming will fix this. Shaved, double coated dogs may be exposed to harmful sunlight and also not be able to cool properly. I’m tired of cleaning up dog hair. Well, they aren’t called “German Shedders” for nothing. Properly grooming your German Shepherd will minimize the amount of dog hair left blowing around your house like a tumbleweed. If it is hot and humid in your area, you may need to shave your German Shepherd. This totally contradicts what most people say about their double coat. Well, most people are an echo chamber. Ask any veterinarian in Houston Texas about the hot, humid days of summer. Additionally, some medical procedures require some shaving, such as treating hot spots. What if I shave my German Shepherd anyways? Image credit: My Furry Friends. Please comment below if you’ve shaved your German Shepherd Dog. We would like to hear from you. Please let the world know if it went well and if you’d do it again or not.